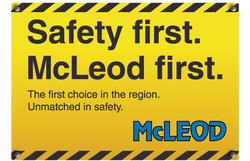 McLeod occasionally email out a newsletter "ntk - Need to Know" which provides valuable industry news for businesses or the "McLeod Newsletter" on whats happening at McLeod. You can subscribe to receive these newsletters below to stay informed on our services. If you are already receiving our email you can subscribe or unsubscribe at any time. This service is monthly.